Back of Lamar Advertising billboard on Sepulveda Blvd. 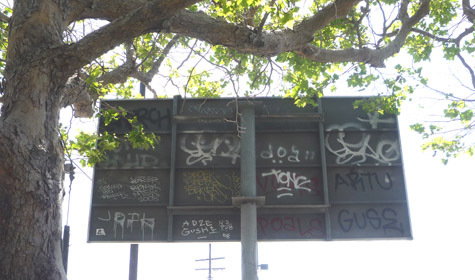 in West L.A.
Lamar Advertising, the Louisiana-based billboard giant, has been especially aggressive in promoting the usefulness of billboards for the display of public service messages. So perhaps the backside of this Lamar billboard currently advertising a chain of mattress stores does a public service by providing a community bulletin board for taggers.